Candidates with B.Tech/B.E in Civil, Environmental, Water resources, Agricultural Engineering and related areas with valid score of GATE. Candidates with B.Tech /B.E or M.Sc. in Electronics and Communication Engineering or Computer Science Engineering or equivalent with valid GATE. Selection will be based on GATE Performance. GATE fellowship at the rate of Rs. 12400/- p.m. (tenable for a maximum period of 24 months) will be awarded to Indian Nationals doing the M.Tech. Programmes, subject to Institute rules. They are required to assist the department for 8 hours of work per week related to academic activities of the department such as laboratory demonstration, tutorials, evaluation of assignments, test papers, seminars, research projects etc. Seats are reserved for Indian National under the categories, SC/ST/OBC (Non- creamy layer)/EwS (Economically Weaker Section and PwD (persons with Disability) according to the Government of India rules. 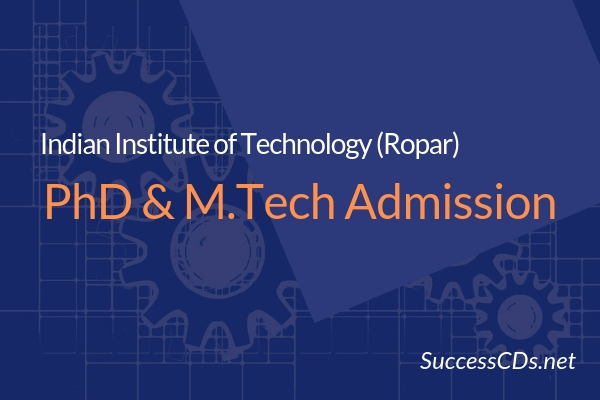 In all matters relating to admission to M Tech programme, the decision of the M Tech Admission Committee is final. Last Date for applying online is 20-04-2019. Exceptional candidates having relevant B.Tech./B.E. qualification with valid GATE score can apply for direct admission to PhD programme. A candidate with a Bachelor's degree from any IIT and having a CGPA/CPI score of 8.00 (out of 10.0) and above are exempted from requirement of GATE qualification to apply. UGC-NET-JRF/CSIR-NET-JRF qualified or NBHM or equivalent qualification. English Literature: Film and Literature, Genre Studies, Popular Culture, Postmodern Literature, War Literature ; Philosophy and Literature; Cultural Studies; Literary & Critical theory; American Literature, Travel Literature. Management: Consumer Behavior, Consumer Psychology. A MBBS, BVSc, or BDS, with a minimum of 65 percent marks (7.0 grade points on a scale of 10). Relaxation for SC/ST candidates as per GOI rules. A research scholar under the External Registration Programme will carry out major part or all of his/her research work in the industry/research laboratories employing the scholar. Research scholars under the External Registration Programme (ERP) should be sponsored by and employed in industries/research laboratories having R & D facilities and recognized by DST or IIT Ropar. GATE or Equivalent Qualification is not required for admission. Should have completed full time employment of 2 years of service as on the deadline of application. Organization/Institution must have at least 5 years of its existence for sponsoring candidates to ERP programme. Only persons engaged in R & D work in Technical / Scientific Institutions/ Industries or R & D Establishments are eligible. The organization should have adequate facilities for carrying out research. All CFTIs/GFTIs will be considered irrespective of their years of existence. Students under this category get an opportunity to earn a doctorate in Engineering / Sciences / Humanities just after the Bachelor’s degree. Students pursuing in 7th semester of their B.Tech can apply, however they can join in July 2019. Please read all the instructions before filling up the application form. You are required to submit the application ONLINE. No downloadable forms will be available. After filling the form, you are advised to take a print of your application and keep the same for your record. You can submit separate application to departments of your choice by paying separate application fee. The OBC (Non-Creamy Layer) Certificate issued after 01.10.2018 (financial year for 2018-19) in the prescribed must be uploaded in the ONLINE application and submitted at the time of admission. You should check the admission website for important announcements. NOTE: Candidates called for written test/interview should bring with them original and photo copies of relevant certificates.